A special relationship exists between people and their pets. For many Downtown businesses that house animals, this relationship extends beyond the owner and to the customers as well. 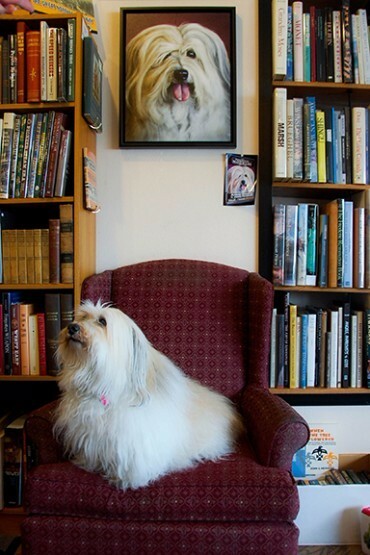 Both Cinnamon Dokken, owner of A Novel Idea, and Pat Wendt, owner of Bluestem Books, said having animals in their stores makes customers feel at ease. 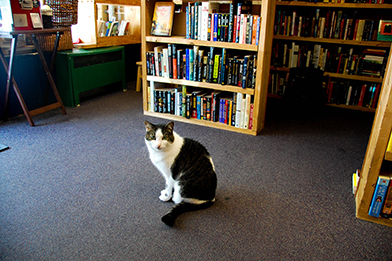 Dokken said buying books can be a very personal thing and her cats' presence helps customers open up and feel comfortable. 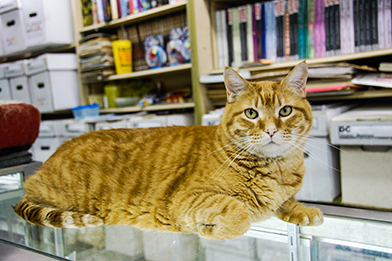 Though not all Downtown pets are willing to be held and cuddled by customers, each adds a unique element to the stores they call home. Below are the bios of eight Downtown pets from a variety of stores, each with their own quirks and personalities. Bio: Katy is described as being a sweetheart and has called Trade A Tape her home for nearly a decade. Katy was found in an alleyway downtown at an unknown age but, unlike most feral cats, Katy was friendly and allowed herself to be carried and petted. This lead owner Larry Lorenz to believe she was abandonded by previous owners and he happily gave her a new home. Bio: Herbie is Katy's son. When Katy came to Trade A Tape, she was pregnant. 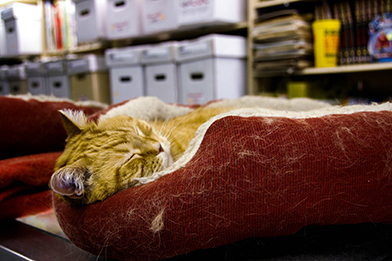 While one kitten passed away and another was adopted to a friend, Herbie remained at the comic book store. He's less social than his mom, but once he is warmed up to someone he loves to cuddle. 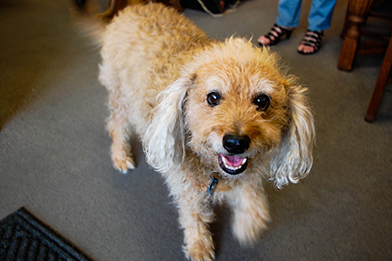 Bio: As the Manager of Customer Relations, Don Diego makes sure to greet each customer who enters Bluestem. Don Diego, who's named after Zorro, can currently be seen sporting baby socks to help reduce symptoms of his seasonal allergies. Bio: Padric is described as being "a cross between an infant and an old man." Padric mostly keeps to himself, but is surprisingly mischevious and is usually found plotting his next sneak attack as he looks out the window. Bio: Padric and Eddy were adopted together from The Cat House, with Eddy being the more social of the two. 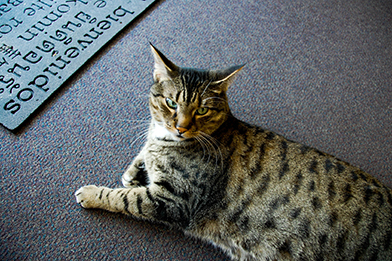 Owner Cinnamon Dokken described Eddy as very gregarious and said he can be needy, especially when she first comes into the store in the morning. Bio: Murray enjoys roaming Gallery 9, belly scratches and also competing in agility courses. He trains two or three times a week. Owner Judith Andre said Murray is generally laid-back unless he’s competing in—or training for—agility. 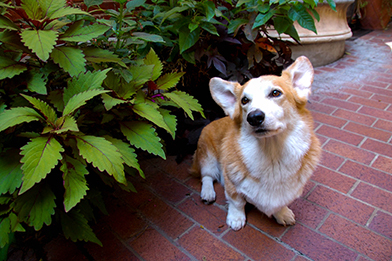 Bio: Not to make Eddy and Padric jealous, but you can't have a downtown pet story without mentioning the late Silas. 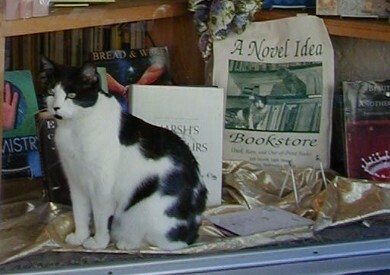 A Novel Idea's famous feline patrolled the realm until he passed away in 2009. Don't worry, we all know legends never die, especially ones who star on Jeopardy. 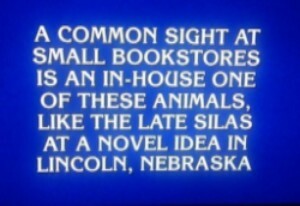 That's right, in 2012 the popular trivia show featured the category "Remember Bookstores?" The Question (of course): What is a Cat?